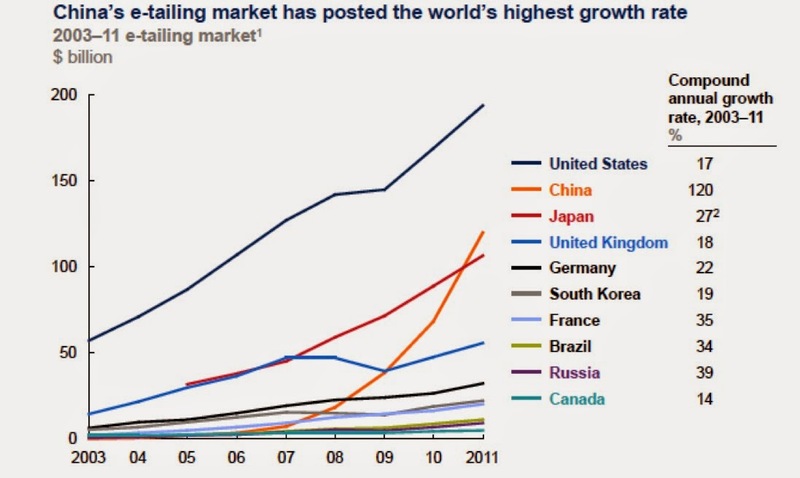 Musings on Markets: Alibaba: A China Story with a profitable ending? "Upon the occurrence of certain liquidity events with respect to Alipay (which includes, subject to certain conditions, an initial public offering of Alipay, a transfer of 37.5% or more of the equity interests of Alipay or a sale of all or substantially all of the assets of Alipay), Small and Micro Financial Services Company will pay to us an amount equal to 37.5% of the equity value of Alipay achieved in such liquidity event, with a minimum payment of US$2.0 billion and a maximum payment of US$6.0 billion , subject to certain increases and additional payments if no liquidity event has occurred by the sixth anniversary of the date of the original agreement, or the liquidity event payment. If a liquidity event does not occur by the tenth anniversary of the date of the original agreement, we will have a right to demand Alipay to effect a liquidity event as soon as practicable, provided that the equity value or enterprise value of Alipay at such time exceeds US$1.0 billion." Since Alipay has such a large market share and processes a very high volume of payments, it should easily have a market cap of $16B or greater. (Ebay's market cap is ~$63B and I believe Paypal is roughly half of Ebay's operating profit). For this reason, I would suggest Alipay's value to Alibaba to be the maximum of 37.5%, or $6B, adding an extra $2.5/share to your valuation. Thanks for sharing your work, I have always been a fan. thanks for sharing information about employment.this very helpful for all employed or unemployed guies. today this is very difficult to find a good job in the best track so most of the guies change his track. Thank you for pointing that out. I will try to incorporate the value of this payoff, though it will be less than $6 billion, after you incorporate time value and the probability that the event may never happen. 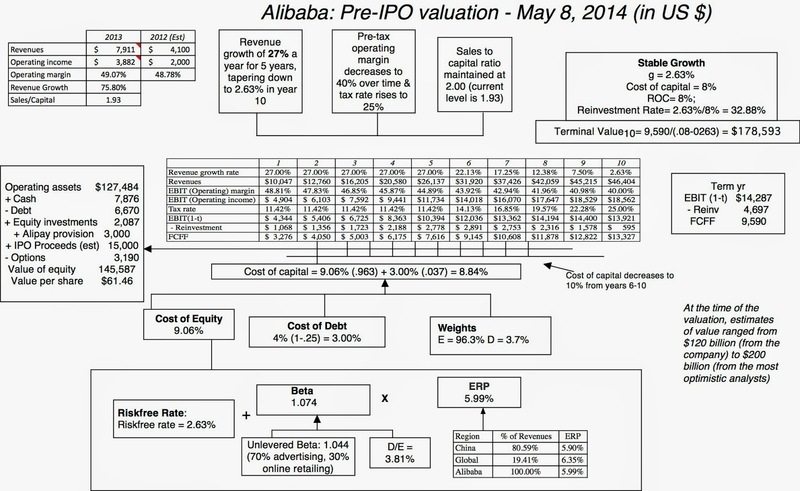 On the issue of Alipay, there are two kinds of cash flows that Alibaba can expect. First, as Blake said, there is a 2-6B cash flow when Alipay is sold, that will represent 37.5% of the total post-sale market cap of Alipay (and not the price paid for the stake sold). Second, Alibaba will license to AliPay certain intellectual property and technology and provide certain software technology services. AliPay will pay to Alibaba a royalty and a software technology services fee, equal to 49.9% share of AliPay’s earnings before tax each year. Also, the sale event can be triggered after 10 years from Alibaba and the collar grows after the 6th year. Did you try running the simulation for checking probabilities of the values? What is the probability value is above or below $127 billion? Professor - Why not add a premium to the cost of capital to capture risk in Alibaba's legal structure and corporate governance? Can I ask why you've added the expected IPO proceeds of $15bn, yet divided by the existing number of (diluted) shares? The current equity value shouldn't depend on the amount of new money raised in the IPO. As a purchaser of Alibaba shares, what exactly are you buying? I only see the right of a dividend, that is, if and only if Mr. Ma finds it in the kindness of his heart to grant one. Why would you choose to value equity based on the FCFF, when the shares in this structure don't have any enforceable rights to FCFF? Yahoo's board certainly understands this. Without an real rights or dividends, investors are betting on a greater fool. For investors like Silver Lake, the IPO is that moment. Yahoo is keenly aware of this, choosing a quiet exit rather than drawing more attention to their troubles with the investment. There is no doubt that investors will look over all of these issues, at least in the short term. However, using any valuation method that goes deeper than a dividend discount model is academically incorrect because Alibaba's structure violates the assumptions of what shareholders are entitled to. How do you handle the withholding tax on dividends between the China OpCo and the Foreign Holding? Alibaba had expanded its business on a large scale all over India, the conclusion you arrive at is that the market must be attaching a negative value to the parent company's operating assets. 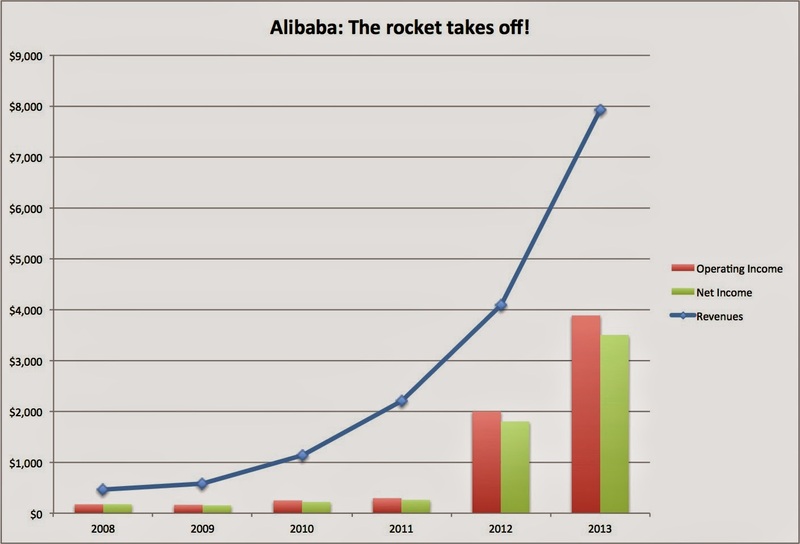 I have to say that Alibaba ia a amazing story the company is huge. China is very innovative and very efficient in goods production. It's very amaze me how they can produce cheap goods. You nailed this valuation! WSJ reports the IPO priced at 60-66 which gives it around a 150b market cap. WOW! Hi Professor - I was keen to understand your assumptions in the cost of capital? Intuitively it seems like you have been too lenient as the business is done in China? I may be wrong, but would love it if you could break it down for me in ur analysis?